Criminals view "Call Centers" as the weakest link in the security armor of financial institutions! 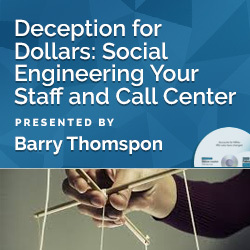 It is easy for the social engineer to scam you remotely because they don't have to physically enter your institution - they can e-mail, chat, or call you on the phone. No one will have their picture, so the worst that can happen to them is you hang up. If your institution prides itself on customer service, not knowing the techniques that organized crime employs, you will take losses. Some of the same techniques can also be used in person. This fast-moving program on preventing losses will focus on the information identity thieves have before they call your institution when trying to obtain information or financial rewards. This webinar will discuss actual attacks used against financial institutions. About the Speaker: Barry Thompson is an international speaker, trainer, consultant and writer who contributes to Bankers' Hotline and Bankersonline.com; he is also a special advisor to Bankers' Hotline. He is a security and compliance "guru" for Bankersonline.com and organizes security conferences for trade groups. 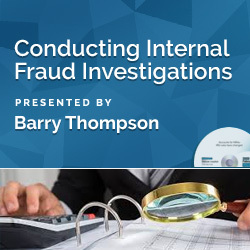 Barry is recognized as a speaker worldwide, presenting in Brussels, Belgium to European bankers on internal fraud; at the United Nations on identity theft; and to Japanese bankers on bank security. Barry has worked in the financial services industry for over three decades, and has held the positions of security officer, compliance officer, treasurer, senior vice president, and executive vice president. He has handled over 900 security cases and has been involved with investigations and prosecutions at federal, state and local levels. This program was recorded in its entirety in May 2016. The CD-ROM includes program slides, materials (if available) and follow-up Q & A document.